I just got promoted to A1C the other day. One thing though, it has only been 30 days since my last promotion. I have the ribbon and everything, but am not promoted on eServices. What do I do? you were promoted, not when you ask about it. I asked, and he said i have to wait 30 days before it can be uploaded onto eServices. Is there anything I can do or do I just have to wait. They are mistaken. It take 30 seconds to click the box, and if you have completed the requirements. on your next promotion since you can't take the next online tests until the previous promotion is approved. It might be time to have a conversation that includes your parents and a copy of the regulations. I get that, but I just promoted in November, and he accidentally promoted me again in December and that I technically wasn't eligible, I hope this does not hold me back. Assuming you don't have accelerated promotions due to JROTC, you should not have been promoted yet. Your ceremony should occur in January when you are eligible for promotion. Wait, are you saying you got promoted to A1C in less then 56 days? I recommend keeping the super chart on hand. I believe it’s in learn to lead 1. Your min time in grade is 8 weeks so you can and will promote then. Guys, it goes like this. I accidentally got promoted to A1C in 4 weeks. I do not do JROTC. It was a mistake by the CDC. I got my ribbon and everything in the ceremony but it is not technical, since it cannot be put on eServices. Again, it has been less than 56 days. There’s truly a wealth of information available on Eservices and I find it surprising that after promoting once you did not know to or did not reference the super chart. I recommend taking full personal responsibility in the future when making sure you are indeed set to promote. should not be wearing A1C or the ribbon until eServices shows that new grade. waiveable, without that completed you aren't and weren't an A1C (yet). does promotions regarding the mistake. Concur... you got the promotion CEREMONY, but you should continue to wear your authorized single stripe until you are time in grade eligible in JAN18. If you know the exact date, you could gently remind your Commander or Deputy Commander that "next TUE is my effective promotion date, when you can enter it online, right sir/ma'am?". Then, after he clicks, pin on with pride - and test! Before we had eServices to hold units to the regs, the (often innocent/ignorant if well meaning) abuses were rampant. I knew one unit which was promoting Mitchell cadets with a 70 percent score for years in the early '90s, and other units which skipped PT tests, or ignored time in grade completely. Good intentions are protected against, now (grin). Congratulations on your Achievement - you could spend time over the holidays prepping to ace your next set of tests when they're available! Thanks Spam, Eclipse, and everyone else that really helped. I will contact my CDC in Jan and tell him about this, and ask him to upload it onto eServices. He can't upload it until 56 days have passed from your promotion to Airman. 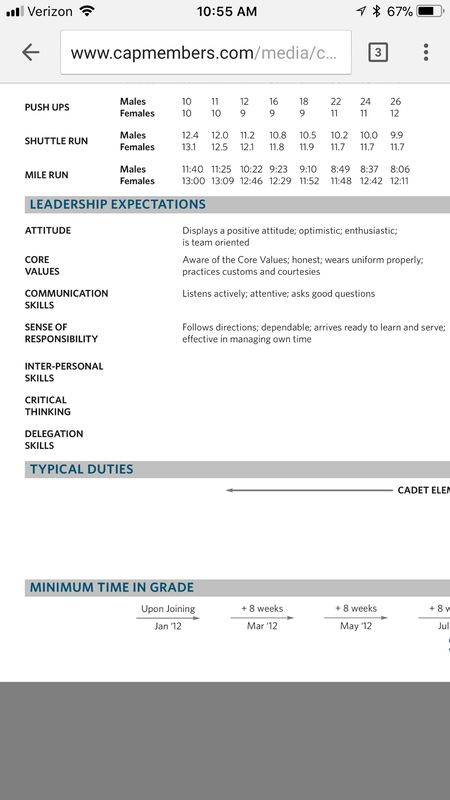 From what you have described, there may be other Cadets in your unit who have similar issues. Your reminder may help other Cadets in your unit. Isn’t there a required time in grade or at least 60 days though? Like if you wouldn’t be eligible for promotion if you haven’t spent 60 days in your grade? So unless our friend was a member of JROTC, he/she should not have been eligible for the promotion they recieved, and it’s not the squadron commander’s fault that they can’t put it in eservices? Page created in 0.081 seconds with 27 queries.